Located in Hillsboro, Ohio, Highland holds an annual health fair for its mainly rural community. 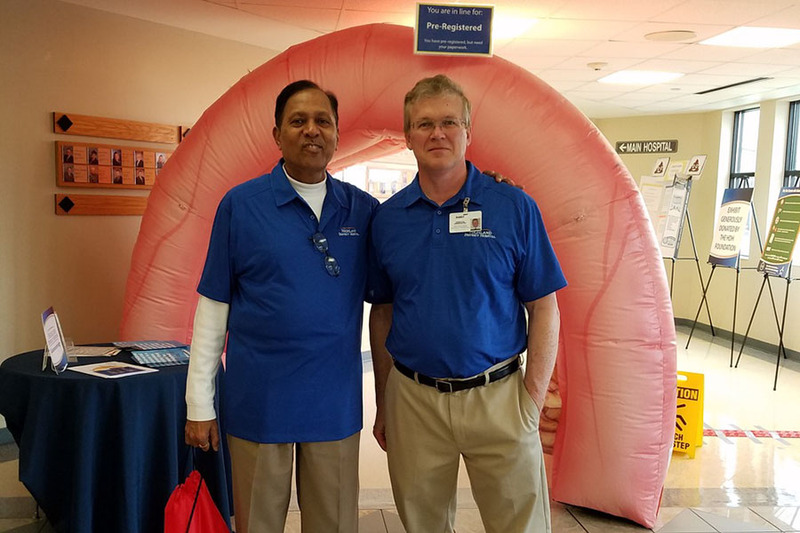 And, at its most recent fair – April 14, 2018 – it unveiled the inflatable replica: a huge pinkish-orange arch that looks exactly like a large intestine, complete with faux blood vessels and polyps (small growths that can lead to cancer). According to Highland Hospital Foundation Director Cathy Jones, the inflatable arch was set up right at the fair's registration area. That meant participants had to walk through it in order to enter the fair. Some 800 visitors passed under the arch in the course of three hours... and most were impressed (as well as amused) by the dramatic display. Two physicians were on hand to answer visitors' questions. And, says Jones, it all went off beautifully, as participants gained greater awareness of the importance of preventive screenings. Why did Jones choose Landmark to construct the realistic inflatable replica? She reports that she'd received a recommendation from the staff at Upper Valley Hospital. Which just goes to show that top-quality work will always get great word-of-mouth!